Photo taken at the Scotts Valley “wildflower fields” © Dean W. Taylor. Photo of Randall Morgan, who discovered this species. The red polygon indicates an extant occurrence. 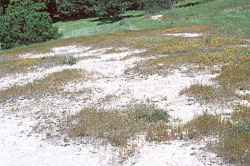 Isolated patches of shallow soil underlain by outcrops of Santa Cruz mudstone and Purisima Formation sandstone in fragments of coastal prairie: 200–300 m.
Annual herbs, compact, often cushion-like; stems erect, 2–5 cm, glabrous, ± angled; leaves persistent and crowded at branch tips; ocrea 4–6 mm, glabrous, proximal part cylindric, distal part silvery, disintegrating nearly to base into straight fibers; petiole absent; blade 3-veined, linear, 5–35 mm × 1–1.5 mm, margins rolled under, smooth, tip acuminate; inflorescences axillary, 1-flowered; pedicels absent; flowers closed, perianth 2–3 mm, tube 6–18% of length, white with whitish or pink margins, lobes oblong, tip acute, mucronate; midveins unbranched; stamens 8; anthers orange-pink; achenes included in perianth, olive brown, ovate, 2–2.5 mm, faces shiny, smooth (Costa 2013). Northern Scotts Valley (Santa Cruz County). Limited to 11 small colonies at two sites in Scotts Valley, Santa Cruz County, less than one mile apart and occupying a total area of less than one acre. 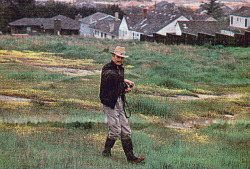 Randall Morgan, a Santa Cruz botanist, first noticed P. hickmanii in 1990 and verified its identification in 1993. Further review and investigation confirmed that it was an undescribed species, and in 1995 it was officially described (Hinds and Morgan 1995). 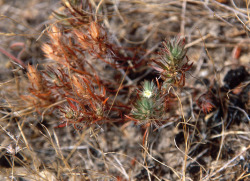 Little is known about its historical range and distribution, but the species has likely always been limited in distribution due to its extremely restricted habitat—one that it shares with the endangered Scotts Valley spineflower (Chorizanthe robusta var. hartwegii). The first of two known occurrences is located on the privately owned Polo Ranch property. As of July 2007 the City of Scotts Valley has approved a 41-unit subdivision for the Polo Ranch property. This project will have a direct negative impact on the species due to grading coming within 26 ft of a recently documented location, along with other general secondary impacts such as changes in the overall hydrology of the site. Since its discovery, the total number of plants observed in any given year has ranged from 2,325 in 1997 to 294 in 2003. The loss is largely the result of invasive plants as well as illegal off-road vehicle use. Prior to the early 90s the site was grazed and population numbers remained stable. The only other known occurrence of P. hickmanii is the Scotts Valley High School's eight-acre preserve and a smaller adjacent patch on land owned by Salvation Army but managed by the Scotts Valley Water District. Plant numbers here have remained stable for the last seven years, though there is concern about encroachment of invasives and future development on the Salvation Army site. The species is threatened by competition with invasive exotic species, which could be exacerbated by excessive soil disturbance (off road vehicles, inappropriate grazing regimes, etc), atmospheric nitrogen deposition, changed hydrologic regimes, and/or changed insolation levels. Cheap, V. Personal communication [3 August 2007]. CNPS, Rare Plant Program. 2014. Polygonum hickmanii, in Inventory of Rare and Endangered Plants (online edition, v8-02). California Native Plant Society, Sacramento, CA. http://www.rareplants.cnps.org/detail/20242.html [accessed 26 February 2015]. Costa, M. 2013. Polygonum hickmanii, in Jepson Flora Project (eds.). Jepson eFlora, http://ucjeps.berkeley.edu/cgi-bin/get_IJM.pl?tid=80205 [accessed 25 February 2015]. Gogul-Prokurat, M. 2004. Report to the Fish and Game Commission on the Status of Scotts Valley Polygonum (Polygonum hickmanii). State of California, The Resources Agency, California Department of Fish and Game, Sacramento, CA. Hinds, H. R. and R. Morgan. 1995. Polygonum hickmanii (Polygonaceae), a new species from California. Novon 5(4):336. U.S. Fish and Wildlife. 2009. Polygonum hickmanii (Scotts Valley Polygonum) 5-Year Review: Summary and Evaluation. Ventura Fish and Wildlife Office, Ventura, CA. http://ecos.fws.gov/docs/five_year_review/doc3225.pdf [accessed 25 February 2015].